Tien-Mou/Taipei City. The United States have reached the Gold Medal Game at the II 12U Baseball World Cup. In the first semi-final at Tien-Mou Stadium on Saturday morning they defeated Japan 9-1. Three runs in the third gave them the lead; six in the fourth blew the game wide open. They now will face the winner of the second semi-final between Chinese Taipei and Venezuela on Sunday afternoon. Japan has to settle for the Bronze Medal Game. Japan had the better start into the contest, taking a 1-0 lead on a RBI single by Hirokazu Kikuta, who drove in Tomoharu Moriya who had reached with a leadoff double. But this would be the only time they were able to do anything against a strong pitching trio. Joseph Naranjo, Adam Crampton and Kevin Martin combined to keep Japan to three hits, a run and a walk in six innings. On offense the US boys got things started in the bottom of the third. Carson Tucker and Adam Crampton led off with singles. Both came around to score on singles by Anthony Volpe and Yohandy Morales. Loading the bases with one out Garrett McMillan got hit by a pitch, forcing Volpe over the plate as well. Already in control of the game, Team USA added six more runs in the fourth. RBI singles by Morales and Gabriel Briones made it 5-1. Colton Olasin’s grand slam put the game into the books. Volpe led all batters with three hits, two runs and a RBI. Koyo Mizushima had the lone out for Japan besides Moriya and Kikuta. Kikuta also got charged with the loss, surrendering six hits, three runs and a walk in 2 1/3 innings. 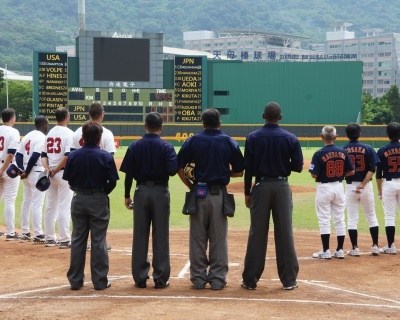 Team USA will face the winner of Venezuela-Chinese Taipei at 2pm in the Gold Medal Game on Sunday. With the win they have reached the final at the 12U Baseball World Cup in their first participation. Japan, which finished in fifth place in 2011, will play for Bronze in the morning. E - TUCKER(1). DP - JPN 1. LOB - JPN 2; USA 7. 2B - MORIYA(3); BRIONES(2).